Tensions appeared to surface between Lil Yachty and Soulja Boy on Friday night [October 28], when the Sailing Team captain hit up the SODMG CEO to ask what the deal was with him posting up pictures with India Love on his Instagram page. In the message, Yachty, who has publicly acknowledged Soulja Boy as an influence on his career, expressed disappointment over his counterpart giving off the impression that she is his girl and swiftly asked that he take the flicks down. But Soulja Boy wasn’t trying to hear it. Soulja Boy posted about a half dozen images of he and India seemingly coupled up. In one bathroom selfie, she sits on a counter with her legs straddling his waist, and arms wrapped around him as she kisses his neck. By Saturday morning he had posted several more. 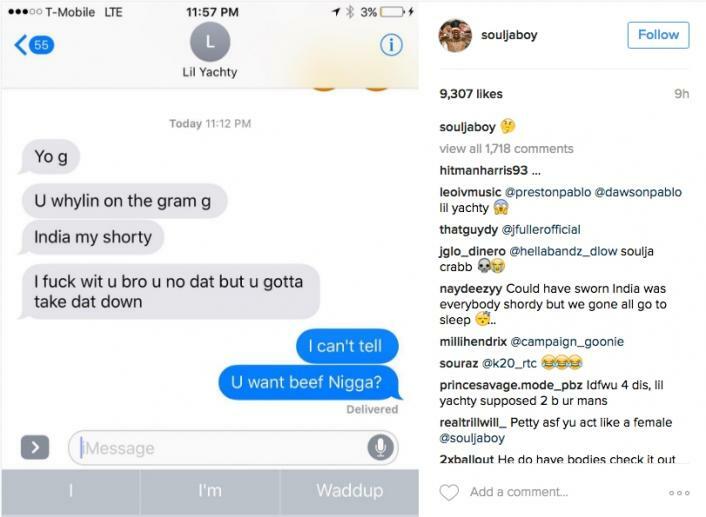 Things seemed to be cool between Soulja Boy and Yachty leading up to the ordeal, with Yachty tweeting a Vine of his elder on Thursday.